As defined by Individuals With Disabilities Education Act (IDEA), the term "child with a disability" means a child: "with mental retardation, hearing impairments (including deafness), speech or language impairments, visual impairments (including blindness), serious emotional disturbance, orthopedic impairments, autism, traumatic brain injury, other health impairments, or specific learning disabilities; and who, by reason thereof, needs special education and related services. By one widely used estimate, some 93 million children or 1 in 20 of those aged 14 or younger – live with a moderate or severe disability of some kind. 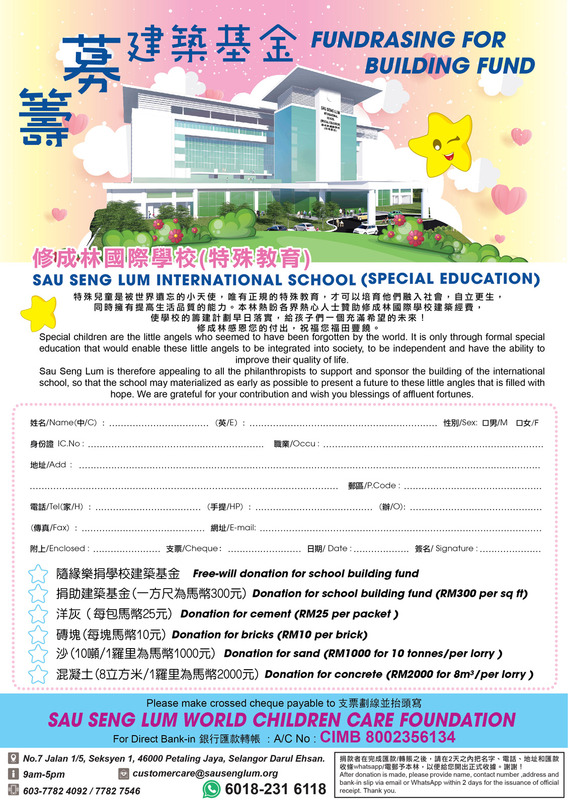 Due to high demands for special needs education from the community, Sau Seng Lum is planning to extend its non-profit services to include special education, which is another vital programme for special needs children. Committed in working alongside families of individuals with learning disabilities, providing quality educational and rehabilitation support through a holistic approach in order to create equal opportunity for each individual regardless of race or religion to reach their fullest potential. To provide information and support to the family members and community. To minimize effects of learning disabilities among special needs individuals by exposing them to therapy intervention and special education as early as possible. To assist in developing functional skills among individuals with learning disabilities in order to maximize independent living in community settings. Centered in the midst of nature creating a therapeutic, stress free conducive learning environment. Physical structures and facilities are disabled-friendly and interactive enabling easy access. Primary and secondary students with learning disability and specific learning difficulties. Children with mental/physical disability due to congenital disease. Children with disability due to traumatic injuries or accidents. At its core, SSL School-Aged programme forms a launching point in education that would hopefully transcend into secondary education. By keeping children involved in the programme throughout their grade school years, they will have the support they need to obtain basic education. The school age programme caters for primary age students from ages 7-12 years Features of the programme includes usage of overseas and local syllabus structured around an individualized educational plan. Programme also includes therapy based activities such as Occupational Therapy, Speech Therapy, Music Therapy and Aqua Therapy. SSL Secondary Vocational Programme caters for adolescence and young adults where an individual transition plan (ITP) is developed to provide transition education and offer vocational training for students thus prepares young adults with potential to transit smoothly from the school environment to the adult work environment and integrating them into the society by matching their skills to meaningful job opportunities. Vocational Skill Training includes areas such as : Housekeeping, Car Wash, Food Preparation, Gardening, Carpentry, Clerical, Assembling and Packaging. © Copyright by Sau Seng Lum. All Rights Reserved.